Marvin JS can import all the commonly used molecule file formats. Marvin JS handles MDL Molfiles V2000 (.mol) and ChemAxon Marvin Documents (.mrv) as input files natively, and other file types can also be imported if the appropriate web service is available. 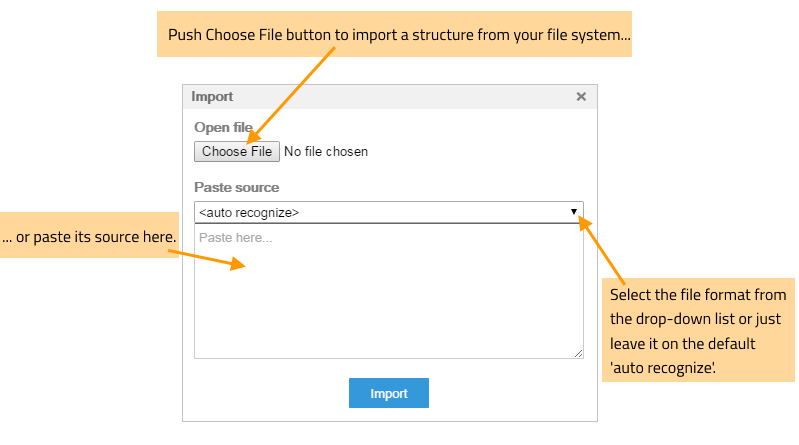 Open the structure file with a text editor, select all, and copy the file contents to the clipboard then paste it into the input area. Above the text field you can select the appropriate file format from a drop-down list, or you can choose the <auto recognize> option. Finally, pressing the Import button loads the structure on the canvas. You can also open your molecule file by choosing it in your file system, and dragging than and drop it onto the Marvin JS canvas.